The Arvonia School served as the only school for the Welsh community of Arvonia from the time of its construction in 1872 until the school closed due to consolidation in 1949. Arvonia was platted in the late 1860s on land purchased for speculation by John Mather Jones, owner of a Welsh-language newspaper in Utica, New York and his associate James A. Whitaker of Chicago. To entice Welsh colonists to buy land in Kansas, Jones published a pamphlet entitled "Arvonia: That Is, The Welsh Settlement in Osage County." Although the town did not meet the expectations of early spectators, many Welsh families remained for generations. 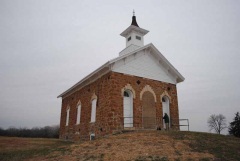 The school was designed by pioneer Kansas architect John G. Haskell, and is one of the earliest-known architect-designed schools in Kansas. However, because the stone building was heavily modified in about 1900 with the removal of the second story, it is not being nominated for its architecture but rather for its local significance in the areas of education and Welsh ethnic heritage. 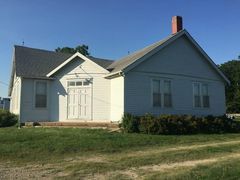 The Arvonia Township Hall, constructed in 1916, is significant for its role in community life in the rural community of Arvonia. For 100 years, the building has housed significant community events, including social and political gatherings of local farmers, war-relief efforts, soil conservation meetings, and celebrations of the community’s Welsh heritage such as St. David’s Day celebrations. Both the Great Depression and World War II changed the Arvonia community and, by extension, the township hall. The last celebration of St. David’s Day occurred in 1940. 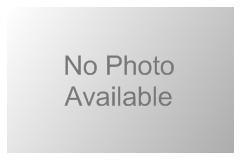 SE Pine St., 0.1 mi. S of int with E Emporia St. 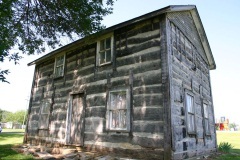 Built in about 1870, the Wells P. Bailey House is a one-and-a-half-story hewn-log residence that was relocated in 1997 from a farmstead two miles east of Lyndon to the Lyndon City Park. The house is rectangular and measures approximately 18 feet by 27 feet. 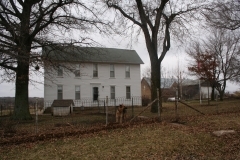 It features a double-pen plan, which closely resembles the center-hall plan commonly found in mid- and late-nineteenth century vernacular residential architecture in Kansas. By 1896, the house was clad with wood clapboard siding, which was removed prior to the relocation. 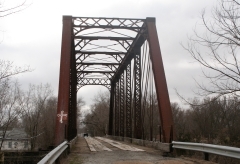 Bailey was a trained machinist and moved his family to Wabaunsee County, Kansas in 1866, before preempting a 160-acre claim in Osage County, near Lyndon, in 1870. He farmed and worked as a milling machinist. Bailey was related to Judge L.D. Bailey, one of the founders of Lyndon, and who named the town after Lyndon, Vermont. The house was nominated for its architectural significance. Built in 1883, the Calvinistic Methodist Church in Arvonia was a center of religious and social activity in the rural Welsh community until the congregation disbanded in 1968. The Calvinistic Methodist Church was established in Wales in 1741 and has roots in both the Methodist and Presbyterian traditions. 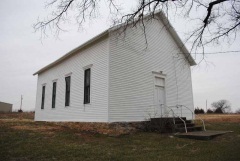 The Arvonia congregation that erected the building had originally organized as a Presbyterian congregation in 1871 and would later rejoin the Presbyterian denomination in 1922. 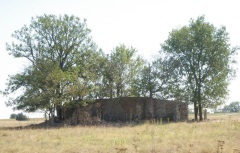 The congregation purchased land in 1882 and hired carpenter Ellis (Al) Evans to build the town's first church. This vernacular wood-frame building is symmetrical and features a front-facing gable with a single central entrance. The building is nominated for its local significance in the areas of early settlement, architecture, and Welsh ethnic heritage.